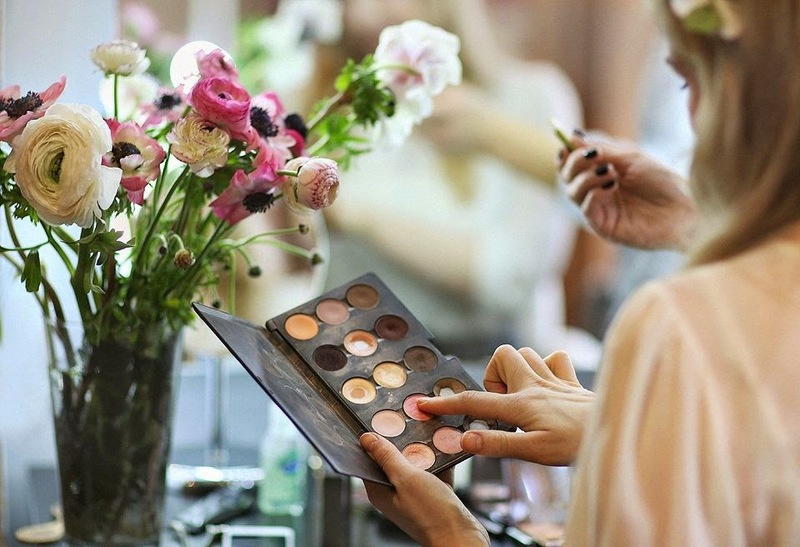 5-DAY ADVANCED BRIDAL MAKEUP COURSE… GIVE YOUR CAREER THE BOOST IT DESERVES! IF YOU’RE ALREADY A MAKEUP ARTIST WHO’S NOT GETTING ENOUGH BRIDAL BOOKINGS OR JUST FEEL AS THOUGH YOUR SKILLS NEED A BOOST THEN THIS COURSE IS FOR YOU. WE’LL FOCUS ON WHAT YOU NEED TO DO TO BECOME AN IN-DEMAND BRIDAL MAKEUP ARTIST WITH A FULL BOOKINGS DIARY. If you’ve had some makeup training already but haven’t started working yet. All because you don’t feel as though you’ve gained the bridal makeup skills to be able to confidently start creating flawless looks and wowing even the most discerning clients. The 5-day Advanced Course is designed to get your career on the right track within the shortest time possible. With clear steps to follow in order to build a life and business around doing the job that you love. Of course miracles don’t happen overnight and perfection takes time and practice but you’ll have a much better chance of mastering bridal makeup artistry with the RIGHT focused education and guidance. After the course you’ll continue receiving support from the Academy via our private Facebook group: expect competitions, job sharing, test shoot invitations, work appraisals, special event announcements and discounts to future masterclasses. 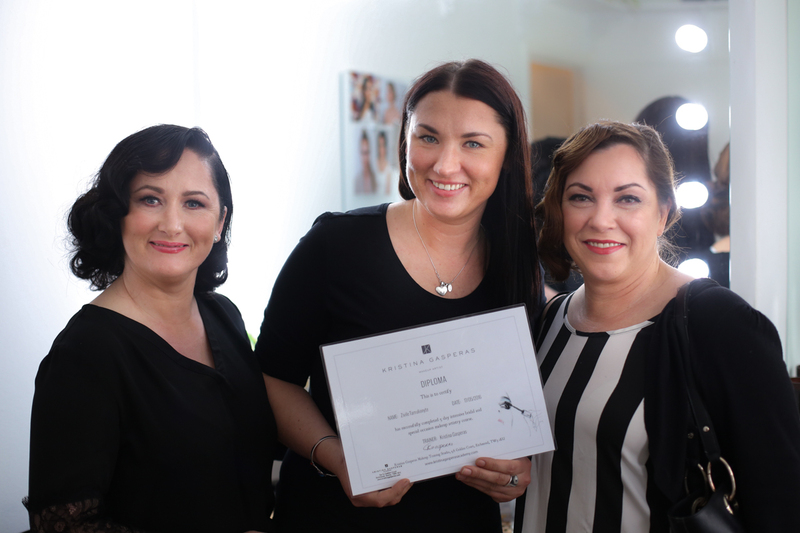 You’ll also be invited to assisting/observation days at the Kristina Gasperas Makeup and Hair Studio which will help you continue growing your skills and keep you on the right path. THE MOST COMPREHENSIVE BRIDAL MAKEUP COURSES IN THE WEDDING INDUSTRY – focused on teaching you exactly what you need to know in order to be successful as a bridal makeup artist. Completely flexible hours – you can study with us in the evenings or split the course over a number of weeks or even months. Together we’ll work out the best times that work for you. Industry secrets, deeper insights and time-saving hacks – we’ve worked out the perfect formula of skills and techniques you’ll need to become a successful bridal makeup artist. Once you complete this course you’ll be fully equipped to start your journey to be amongst the best in the industry. With this set of skills you can earn a 6 figure income as a makeup artist. Intensive teaching – we’ve honed and perfected our craft to become a leading bridal makeup and hairstyling force in the industry. Our teaching methods and insights will ensure that no time is wasted – avoiding mistakes and gaps that come up from inadequate and unfocused education. The Academy support hub – a place where Academy students past and present, as well as the K-Team, provide: support, care, critique, positive vibes and advice on all things makeup and hair. We’ll continue supporting and guiding you in your career. You’ll never feel alone because we genuinely care about your success – we even share job opportunities with our past students. FOUR DAYS OF PRACTICAL – WITH TWO MODELS ON EACH DAY. Business advancement – makeup artistry as a successful career. Includes a review of your website, analysis of your pricing structure, social media dos and don’ts, delivering exceptional customer service and continuing your development through practice. Correcting mistakes – how to correct makeup mistakes on the job: uneven eye-liner, shaky lip-liner, uneven eyebrows, etc. Mastering error correction is half the job! We can provide an in-house makeup kit for this course however we encourage you to bring your own if possible so that you learn using the products that you prefer. So WHY would you need any additional modules? We offer these add-ons to give you a chance to develop even more new skills for an extra edge that will help grow your business faster. YOUR GALLERIES ARE YOUR BIGGEST SELLING POINT. If you go through all the hard work of becoming an awesome makeup artist then you should learn how to showcase your work how it deserves to be seen. Don’t display it in unflattering, murky and badly composed images so that your website and Insta visitors can’t clearly see the details of your expertly applied makeup. You don’t want potential clients leaving you as soon as they’ve seen your images, you want them to become clients! HOW WILL YOU STAND OUT FROM THE CROWD and capture attention in this over-saturated visual world? In this 4-hour workshop learn how to do justice to your work by taking clean, flattering beauty portraits that will make your website and Insta visitors fall in love with your portfolio and WANT your services. It will unravel the mysteries of camera functions and you’ll work through practical photography exercises designed to help you capture your clients in impressive close-up images that showcase the makeup. Learn how to master flawless high-glam makeup which is amongst the most frequently requested looks by brides and special occasion clients. Get rid of any anxiousness around being unsure how to create different makeup looks – learn a new skill and gain confidence. This hands-on 4-hour masterclass is run by the K-Team wow-factor aficionado Aušra who has spent endless hours perfecting her skills. She’s created stunning glamorous looks for TV presenters, awards ceremonies, red-carpet events and even OBE receipients. She’s completely immersed in the latest makeup trends. You’ll have a beautiful model to practice on and with Aušra‘s undivided attention will learn how to master this look. Maybe it’s time for a website revamp. So to save you time and hassle scouring the internet trying to find a suitable website template design with easy installation and maintenance we’ve teamed up with some awesome template designers and are able to offer a special rate for you. You can install their templates following some very easy steps yourself or if you need help you can book some time with them – they’re amazing! As standard course days start at 10am and finish at 3pm although timings can be changed to suit your availability. A diploma is awarded upon successful completion. Courses are run at the Kristina Gasperas Makeup and Hair Studio, 5A-7A Golden Court, Richmond, Surrey TW9 1EU although can be booked for a location of your choice. Once a course with the Academy has been completed discounts are available for future courses and masterclasses. To book a £350 deposit is required with the balance settled 2 weeks before the course start date. All major credit/debit cards accepted excluding American Express. Check out the Why Study With Us page for more information and inspiration on why studying at the Kristina Gasperas Beauty Academy is for you. Please contact us using this Contact Link. We can’t wait to hear from you and help you achieve your goal of a successful makeup artistry career.